It happens that I follow some photobloggers in the UK. They’ve been sharing rainy autumn photos lately, while here in the great Midwest it’s been mostly sunny, as usual. 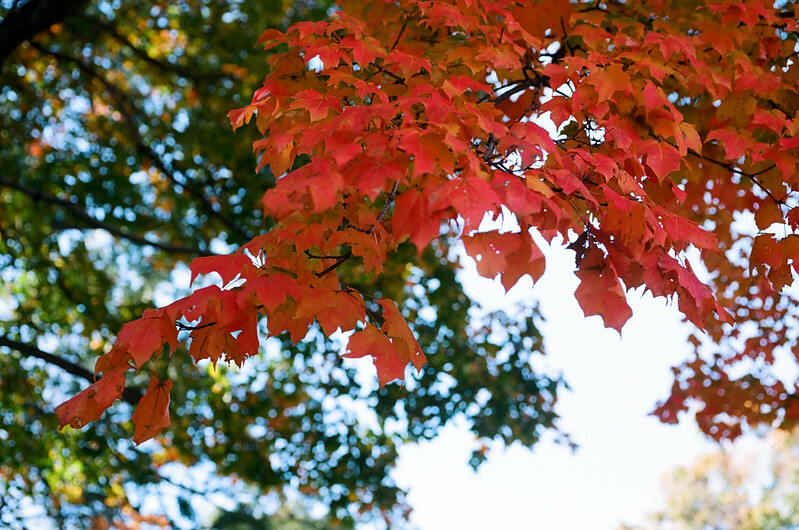 So consider this post a counterpoint: autumn in brilliant sunshine. I like to give my Nikon F2AS regular exercise, so a few weeks ago I filled it with Kodak Ektar 100 and mounted my 55mm f/2.8 Micro-Nikkor lens. That film is great for bold color, and that lens would let me get super close if I wanted to. It turns out I didn’t want to get super close, but no matter: that lens is a fine prime. 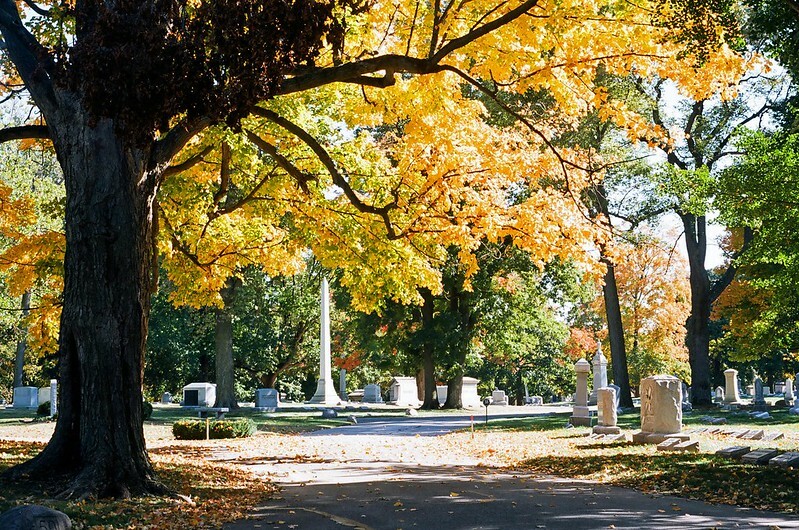 I drove down to Crown Hill Cemetery, the largest non-government cemetery in the United States. It’s just a few miles from my home, right on the old Michigan Road. Fall colors were becoming established, but plenty of trees had not yet begun to turn. I would have liked to wait for that brief sweet spot when all trees were showing their colors, but few of them had yet gone bare. That day doesn’t come every autumn, and when it does, I can’t count on being able to get out that day. Maybe I have to work; maybe it rains. Yes, it does rain. It’s not all sunny days. But it’s not all rain, which the English bloggers I read suggest is the norm where they live. At any rate, it was a sunny day off and I had to capitalize on it. 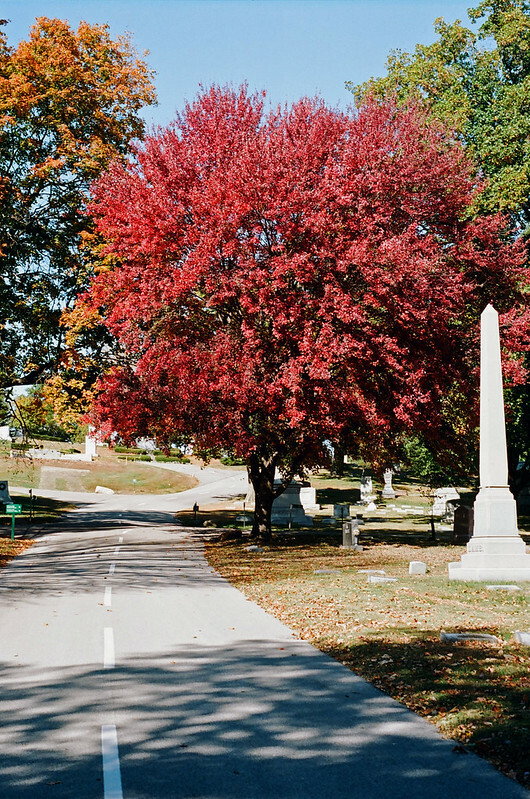 An extensive, overlapping road network snakes through Crown Hill, making it easy to see by car. For several of these photos, I drove until I saw an interesting scene, and exited the car just long enough to frame, focus, set exposure, and press the shutter button. For other photos, I shut off the car and walked a little. 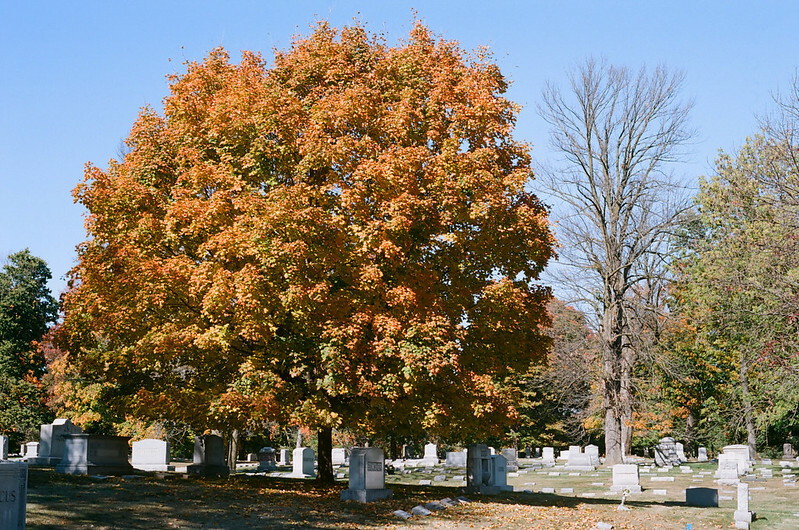 I love how the gravestones in this photo look like they come from a black-and-white photograph, in sharp juxtaposition to the trees’ colors and the blue sky. I’m not sure why I enjoy cemeteries so much. I don’t want to be buried in one. What a waste of land! Cremate my body after I’m gone. Let the ashes fertilize a garden. I no longer inhabit those molecules; might as well put them to productive use. Maybe it’s because I once lived on cemetery grounds. While I waited for my divorce to be final, I lived in the parsonage at my church. The church building was just up the hill, and it was surrounded by a cemetery in which members had been buried since 1837. My sons and I used to run and play among the gravestones. It’s sure handy having Crown Hill so close by. I’ve taken my old film cameras there for years. I ended up taking almost nothing but wide shots. This is as close as I got, and I could have easily made this shot with my 50mm f/2 prime. But no matter; this 55mm f/2.8 macro lens is plenty capable. There you go: an Indiana autumn afternoon. Hm. The trees must grow deadlier in the UK. Your Nikon F2AS’ “exercise” yielded some beautiful results, Jim! I was secretly relieved that you enjoy strolling through cemeteries, too. To many people they’re gloomy repositories of death … but with this post you’ve proven quite the opposite. 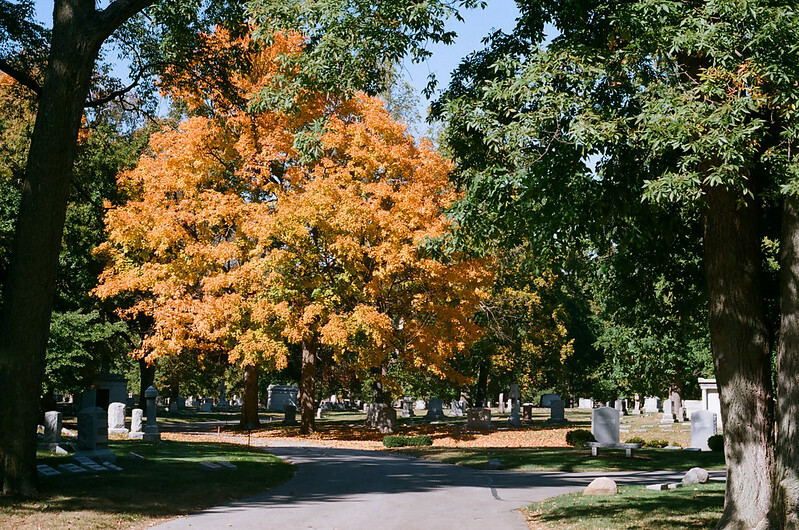 Well, how many people are so fortunate to have a cemetery like Crown Hill so nearby? I’ve never experienced another cemetery as large or as lush. You are fortunate indeed, Jim! I found your description so intriguing that I actually Googled it to see how far a drive it would be from Minneapolis. (Yes, seriously.) Apart from being gratified to see that it’s not too far off my usual route to Chautauqua in upstate New York, I was surprised to see the huge swath of valuable land it occupies near the heart of the city. That made me grateful that most people have a thing against cemeteries, because at least this one chunk of green space has a chance of evading development. 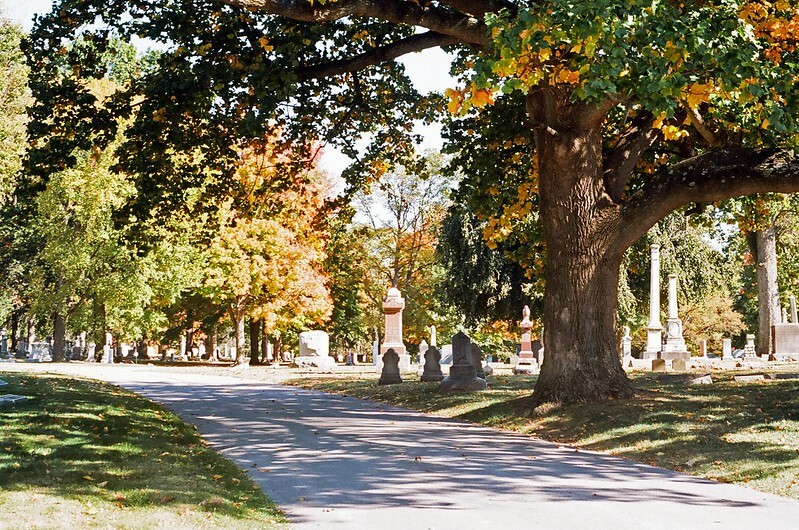 I can’t imagine how dipping way down to Indianapolis isn’t that far off a trip to NY, but hey, if the spirit ever moves you to make that dip I’d be happy to show you around Crown Hill. 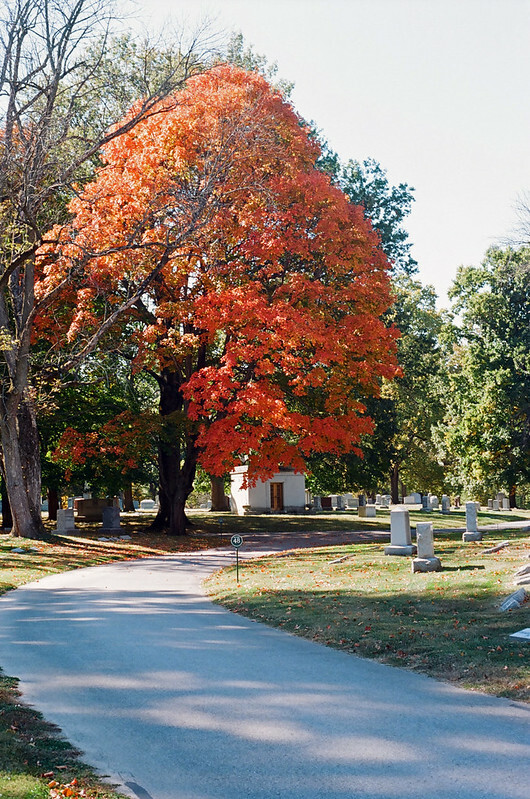 When the cemetery was founded, it was on the outskirts of town. The city has grown around it. During one semi-annual trek to NY I once became so engrossed in an audiobook that I accidentally drove clear across Ohio, Jim — so a dip into Indianapolis wouldn’t be that big a deal. Rest assured that if such plans ever materialize, I’ll drop you a note. 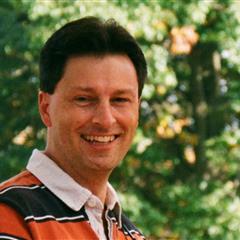 I’d be so honored to have you for a tour guide! 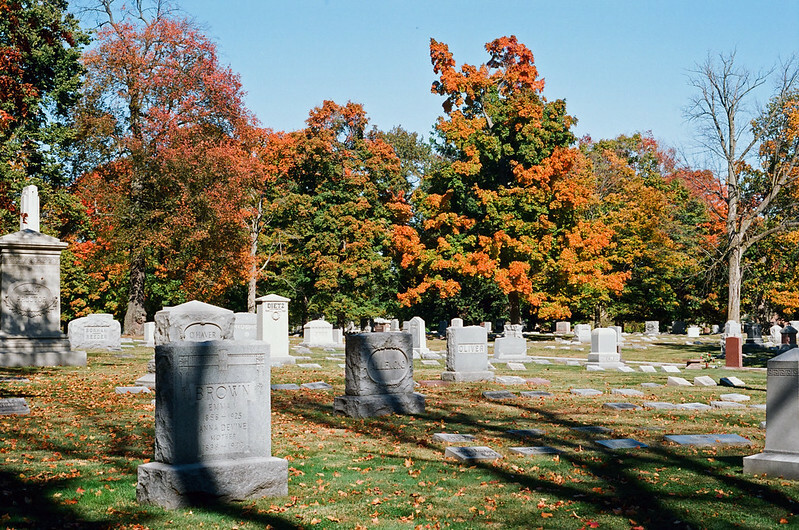 In Victorian times, people used to picnic in cemeteries on Sunday afternoons. Pictures of those times show people (with parisols) walking the cemetery grounds or sitting on blankets (some eating and drinking) and enjoying the peace and beauty. Your photos explain what is now a curious thing to do. Maybe we should put on formal clothes, find a parasol or two, and take a stroll through this place! These are very good. Please again explain your scanner model. I always have the processor scan the negs, so it’s whatever they have.